How often does the human skin regenerate itself? Most of the cells in the human body multiply themselves every 10 hours on average. Though, the skin cells have a higher regeneration capacity than others, but i'm not really sure about an exact answer. Hopefully, someone will edit my answer with the exact value . 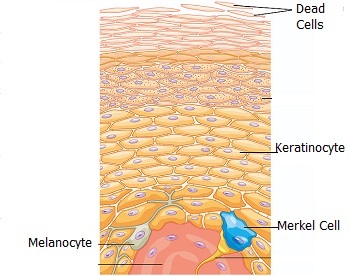 New skin cells (keratinocytes) are continually forming at the bottom of the epidermis. As new cells form, they push the more mature cells toward the skin's surface, moving them farther away from the blood supply that keeps them alive. By the time a skin cell reaches the surface about three weeks later, it's dead. Thus, the skin on your body consists of about 30 layers of flattened, dead keratinocytes. Friction gradually removes the dead cells from the skin surface. The epidermis can be about 3 mm thick in the palms of a manual labourer, while in the eyelids the thickness is only 0.05 mm. Thus, skin cell replacement is faster in the thinner regions of the epidermis.